The structure for the pillars is up and steady. Here is a picture of the work so far, along with an inset of the scale model. The serious-looking fellow in the temple is our Imhotep, Michael. He and his wonderful crew of temple builders have accomplished wonders so far! 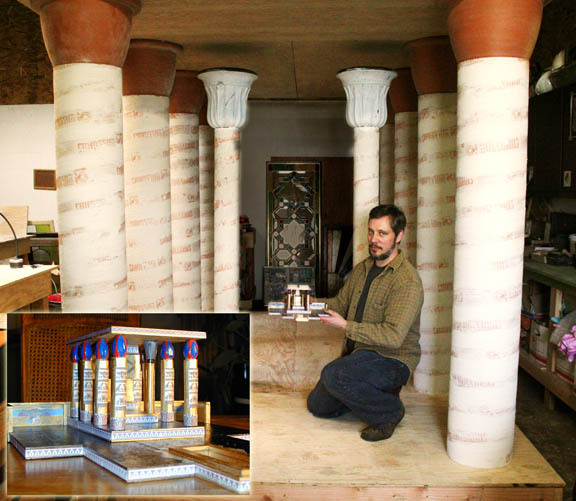 Our temple architect kneels with the scale model inside the Temple of Isis that will grace SunFest XXII, a Celebration of Isis the Radiant Goddess.